If you enjoyed my saint biographies, I have good news for you. 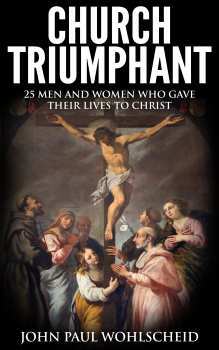 I’m planning to release a collection of 20 saint biographies in ebook form. I’m going to add to the ones I have written already and write several new ones. I don’t have a title. Feel free to suggest one in the comment section. I’m aiming to release it during Lent this year. I’m also planning to published a second ebook collecting the articles I have written on SSPX. That should be published by the middle of the year. Stay tuned for more updates, including covers. Born Roman Catholic. Raised Roman Catholic. Will Die Roman Catholic. This entry was posted in Announcement and tagged ebook. Bookmark the permalink.